SHO-ME 02.6200 TWO-PIECE DIRECTIONAL ARROW BOARD. The Two-Piece Arrow Board is constructed of heavy, epoxy-coated aluminum and comes with a control box, heavy-duty cables, plug-in connectors and plastic cover. Heavy-duty threaded inserts in each arrow panel accommodate a variety of mounting applications (mounting brackets sold separately). Lamps flash 60 times per minute in four operational modes: right arrow, left arrow, double arrow and corner lamps. 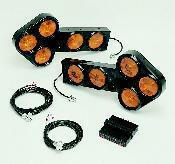 Each panel has five 4" diameter amber lamps that are shock-mounted and weather-sealed. The cab-mounted 3-relay control box has pilot lights that indicate flash patterns, and on/off an dmode selection switches. It connects easily to the Arrow Board with a 15 ft. pre-wired harness, and comes with a bail mounting bracket and all necessary wiring. The 12 volt control box measures 1 1/4"H x 6"W x 6 1/4"D. Maxium amp draw. : 20 amps. Arrow Board dimensions: 13'H x 24"L x 2 1/2"D - each panel. 4.3 lbs.MADE IN USA.